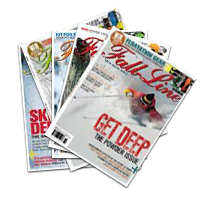 » Telemark Technique Tips » Drills - Improve Your Carving » As Featured in Fall Line Magazine Autumn 2014. Welcome to season two of our telemarking technique series. It's for all you soul skiers out there looking to free your heel this season. Some of you maybe diehard telemarkers already; some may be planning your first foray. Either way, you're not afraid of hard work – after all, telemarking is no walk in the park. It demands dynamism, balance and commitment. This series should help you with the first two, the rest is up to you. Here's Ben from Tele Tracks with an essential drill broken down into manageable steps, to help you improve your carving. As with all performance telemark skills, the inside ski plays a fundamental role in helping the telemark skier maintain control. This role can be broken down into three elements called the 'steering elements’; they are: edge, pressure and rotation. Without them, you won’t be able to turn. For that smooth-as-butter carve, which leaves two clean lines in the snow, it is essential to control these three elements. Here’s a drill that will focus your attention on the effectiveness of your edge, pressure and rotary movements on the inside ski, while it transitions from front ski to rear ski. Get it right and you’ll stick anything, even sheet ice. Like a banked corner on a roller coaster, nothing beats the thrill of carving on teles. Here is an easy-to-follow drill for getting those two clean lines in the snow. Instead of making a lead change in the first third of your arc, wait until you’ve crossed the fall-line. In other words, you’ll have to change edges and steer both skis into the fall-line in a reverse telemark stance, then finish the turn by making a lead change in the last half of the arc. Once you've made the lead-change, continue finishing the turn as you would normally. What Does This Drill Do for Your telemark Skiing? It ensures that you’re actively and effectively changing edge while keeping the inside ski on the snow (rather than picking it up and placing it on its new edge), it’s amazing how often this trips-up even expert telemark skiers. It will help you fine-tune your lateral balance, reducing any excessive lateral movements and highlighting how balance affects pressure control (notice how still pro telemarks keep their upper body). It forces you to fine-tune rotary movements, reducing any excessive twist during the turn which causes skidding, encouraging patience through the arc. It will challenge your conscious competence of lead-change timing and coordination, giving you more choice over when and where you make your lead change and improving lead change accuracy. Get out there and give it a go. Find some nice easy terrain and start with big open turns, keeping your speed down. This will emable you to concentrate on your timing and coordination. Once you're comfortable with the timing of the drill, then you should progressibely up your speed. If you keep plugging away, it will definitely improve your telemark skiing.